In this multiplayer game up to 7 players, climb aboard a space freighter and play as a crew member, a smuggler or a rebel. Cooperate, bluff and deceive the other players to complete your objectives and to be the one who will manage to complete his mission. This game is created for my final year of school. We have one year to produce the best game as possible. This project have been choosen with 7 others in a pool of 30 concepts. The aim is to create a game that could be sell at the end of the year. With "Firebird - La Péri", discover a fantastic universe, where you embody Iskender, a prince in search of the "Flower of Immortality". On stage, visit the enchanting world of La Péri and become a privileged witness of a magical and poetic encounter. I had the chance to work on this game during my internship. I helped the Team to finish the game before selling it on Steam. The game was made in about 1 year and a half. I work for two months on this project. It was my first game in VR and my first commercial project to be released. This game was made for the Epic Game Game of November 2015 on Unreal Engine 4 in C++. It takes about 4 days and 5 peoples to release this game. Become a reporter who wants to prove the whole world that his house is haunted by spirits. Take your camera and open your eyes. If you are carefull maybe you will see some guest. If you prefer to be a spirit, run away in the house and hide from the reporter using your metamorphose skill to take the appearance of the furniture. Both team have spells to help them. If a spirit die, it will become a reporter. When there are no more spirit, reporters win but if the time run out, spirits win the game. H(a)UNT was made by 21 students on Unreal Engine 4 in Blueprint. At the beginning of a game, there are 1 Reporter and 4 spirits. Legacy is a game made for the Epic Mega Jame. This jam last one week.It was made by four students : 1 Programmer and 3 Game Artists. The constaint was "Standing on giant shoulders". The rest of the constraints was up to us. The game is a 3vs3 FPS, in which you receive bonus when one of your friends die. The death of one player upgrade his friends. The rest of the team standing on the shoulders of giant(s), the player who is already dead. All the game was realized by our team members, we created all assets and code. This game was made on Unreal Engine 4 in Blueprint in about one week during the Epic Game Jam of October 2015. It was my very first networking game. Laser Space Robot is a FPS game in a procedural Maze made in C# on Unity . The game is infinite and the goal is the reach the highest level as possible. This prototype was released for a school project by 3 programmers. ​You can shoot robot to earn money and experience points. When you find a shop, you can buy upgrades of your level or under if you have enough money. I coded the shop, the weapon animations, the damage and the upgrades. The maze have been created by all the team. Friendly Arena is a game made in an intensive week by seven students : 3 Game Designer, 3 Game Artists and 1 Game Programmer. The constraint was to make a game about an anime of TeamTo : Oscar & Co. We had the choice to make the game on what platform ever we wanted. In the game, you embody a character of the serie and fight other players to get the bottle. You can jump, dash and fight other players. The bottle is very important because you have to take it and try to open it spamming your attack button. The game end when a player achieves to open the bottle. The others have bonus to help them. They can run faster, jump more times, have shield and throw objects. At the end of the game, you can see the winner and some statistics about each players. This game was made on Unity 3D in C# in about a week. Care is a game made in a two intensive week by thirteen students : 6 Game Artists, 6 Game Designer and 1 Game Programmer. The constraints was to make a political game (game for change) which had women for target. An other constraint arrive at the end of the frist week : Make a relation between this game and a street path game with vikings. All the project would have to run on a mobile phone and tablet. The game had to be a freemium. This game was made on Unity 3D in C# in about two weeks. Procedural Miami is a prototype made with Flash punk and AS3. It's based on the famous game Hotline Miami. You embody a character who has to kill all men in the house. You have two weapons, the batt which you start with and the gun which you have to pick on an ennemy. The aim of this prototype is to put gamefeel as much as possible like screen shake, effects on bullet, etc. The level is randomly generated. Ennemies spawned randomly too. Be careful of the ennemies' displacements. You control the guy with the "arrow" of the keyboard, use "control" to pickup weapons, shoot with the mouse. Feaffafa is a party game made during a 28 hours game jam. Three players fight each others to reach as fast as possible the top of the level. You can jump, take strawberries which contain random power. When a player is out of the screen in the bottom, he looses. The last player standing or the player who reach the top of the level win. This game was made with Unity 3D in C# with two Game Artists, one Game Designer and one Game Programmer. Shoalstorm is a game made in a week by five students : 2 Game Artists, 2 Game Designer and 1 programmer. 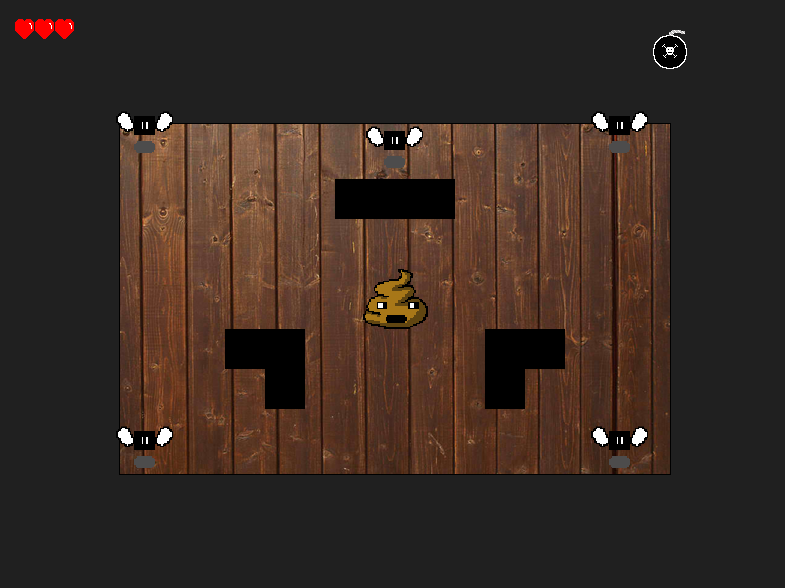 The theme of this week was "make a toilet game" : a game that is played with one input. In this game you embody a fish who wants to save the seas. The goal is to ally yourself with other fish and to destroy human conveyance. Be careful and avoid all the obstacle like coral and submarine. Each action requiere fish. For example, if you want to destroy a fishing boat, you have to sacrify fish. If you have enought fish to destroy it you will earn fish and points. The game ends when you have no fish remaining. When you press on the screen, fish go down and when you release your fish go up. The more you press your screen, the more your fish will go up. A double tap on your screen will compact your fish, to dodge in cave for example. You can "eat" big fish such as whale and dragon fish to gain a lot of fish. This game was made on Unity 3D in C# in about one week. We were five students to work on this project. This Tower Defense is a project made during my 3rd year with an other programmer. The aim of this project was to make a web game using html, js and css. Monsters spawn at a point. To kill them you must put some towers on the grid. There are 3 different kind of tower : landing, flying and water. Each tower has 2 evolutions. Each evolution is more powerful and shoot fastest. Finally, monsters randomly follow one of the three path available. There are different monsters and bosses. Each monster have its own characteristics and some give you a life when you kill it. You can put your towers on trees and evolve it by clicking on it. We chosed to add Warcraft 3 musics to make it more fun. Bind of poop is a rogue like like game. The aim of the creation of this game was to make a game on flash develop. This is my first game on this software. You embody a poop and must kill the boss. You have six lives and one bomb. There are three different types of enemy : flies, spider and following flies. When you kill a spider, two following flies appear. You can move up, right, down and left. You shoot with the mouse only in this four directions.